Diamond Teague Park, located in Southeast Washington DC near the Washington National’s baseball stadium, was one of the first completed sections of the (now) well-used Anacostia Riverwalk Trail. 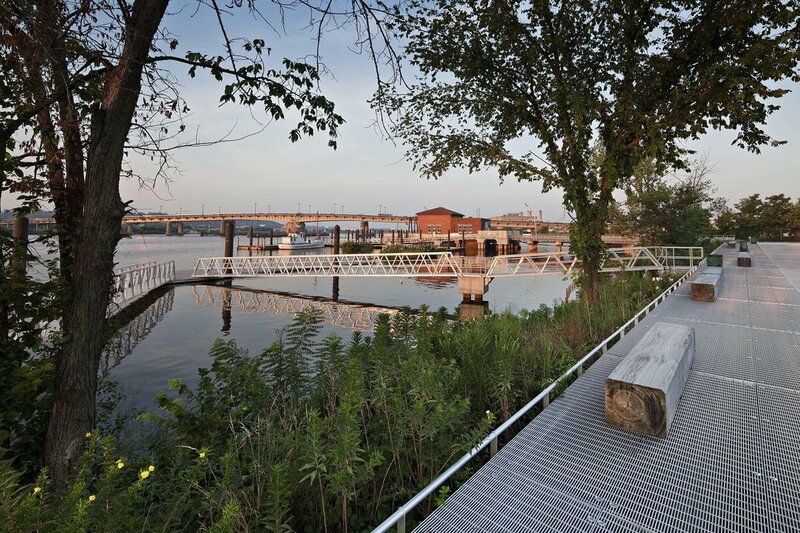 The project consists of an at-grade and elevated promenade, new piers and docks for a local non-profit organization, a floating dock that provides public access to the river, and a section of rehabilitated riverbank. 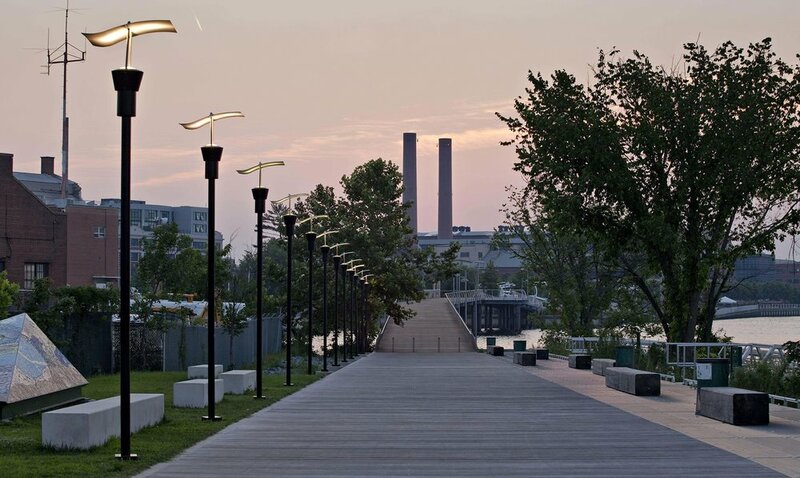 The design is conceived around the need to provide access for a large volume of users, both along the riverfront (as a link in the Anacostia Riverwalk Trail) and for recreational users moving to and from the river itself. In order to provide access and prospect over the river while minimizing disturbance in that area, the edge of the main promenade is composed of metal grating raised above a rare section of un-bulkheaded riverbank. Reclaimed sinker logs in this area have been re-purposed as benches and provide an area for users to pause and enjoy the riverfront. The replanted and rehabilitated riverbank in this area is maintained by the volunteers from the Earth Conservation Corps, a non-profit organization focused on youth development and environmental service, which is headquartered on-site in a historic pump-house. Additional features include several sections of truss bridges that connect a floating dock for launching kayaks and canoes to the main promenade. A second series of floating docks associated with the historic building and pier provide docking facilities for the Earth Conservation Corps fleet of canoes, kayaks and related small boats. The approvals process for this project was especially complex and required coordination with and among several District and federal agencies, including the NPS, Army Corps of Engineers, Coast Guard, Fish and Wildlife Service and Homeland Security.